Gallia Engineer Brett Boothe, right, addresses the Gallipolis City Commission regarding federal grants he aims to attain which could turn Gallia’s part of US 35 into a “smart” corridor. 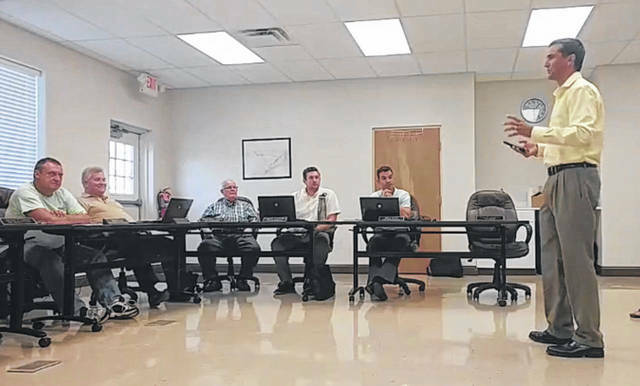 GALLIPOLIS — During a special meeting Tuesday evening, Gallipolis City Commission discussed the nature of Gallia Engineer Brett Boothe’s proposed future of a Gallia with a smart corridor and paved county roads. Boothe previously met with Gallia County Commissioners last Thursday to discuss the same pair of projects, one aiming to turn parts of US 35 and some smaller roads into a “smart corridor” while another attempts to pave the rest of Gallia’s over 100 miles of stone and gravel county roads through the use of federal BUILD program grant funds. Boothe said Gallia would be competing against other grant proposals nationwide but he felt confident that rural projects would receive a potential majority chunk of funding. Gallia’s projects need approved by the right federal eyes however. Should they be approved, both grants could total around $50 million to be brought to the region’s economy to create jobs, update Gallia roads and put Gallia in a position to serve as a potential leader in testing smart driving technology in southern Ohio, said Boothe. As part of hopes to turn Gallia into a testing ground for the self-driving trucking and automotive industry, fiber optics would need laid along US 35 and potentially along the Farm Road bypass in order to create a loop. Line has already been laid along Ohio 588 as part of other endeavors, said Boothe, and a connection with previously laid line could help create that loop. The engineer said last week he has had favorable conversations with the Ohio Department of Transportation and area internet service providers about the potential for public and private infrastructure improving partnerships. Part of that plan includes linking Farm Road with downtown Gallipolis. Commissioners discussed whether Farm Road should link with Second or Third Avenue and what challenges would come from potential construction. Boothe addressed concerns with a possible smart truck center along US 35, saying it would appeal to hauling businesses looking to the future of technology as they crossed country. The center would have increased parking for semis traveling US 35 as spots for resting drivers in Gallia are limited along the highway. Truck drivers approaching the center would be able to identify open spots through electronic signage and could potentially use electronic charging stations to power their vehicles. The center would be created from an already existing rest area. Boothe stressed that while county residents may not utilize said charging stations, grants proposals meeting certain criteria often scored better than others in competition. The addition of charging stations to the grant applications and the investment costs in them were far outweighed by the potential benefit of bringing “tens of millions of dollars” to the area in the form of jobs and infrastructure improvements, said Boothe. The addition of charging stations were a means to achieve grant proposal approval. Boothe also asked commissioners if they would be open to changing the name of Farm Road to include the name of passed Gallia icon and resident Bob Evans as his legacy was recognizable across the country. He and other area officials intend to visit Washington D.C. in the coming week to discuss the improvement projects with federal officials. Boothe felt the road name change would make the project stand out when compared to competing projects. City commissioners agreed and voiced their support of Boothe’s proposal. They said they would need to discuss the legal process of changing a road name within municipal limits, among other concerns.